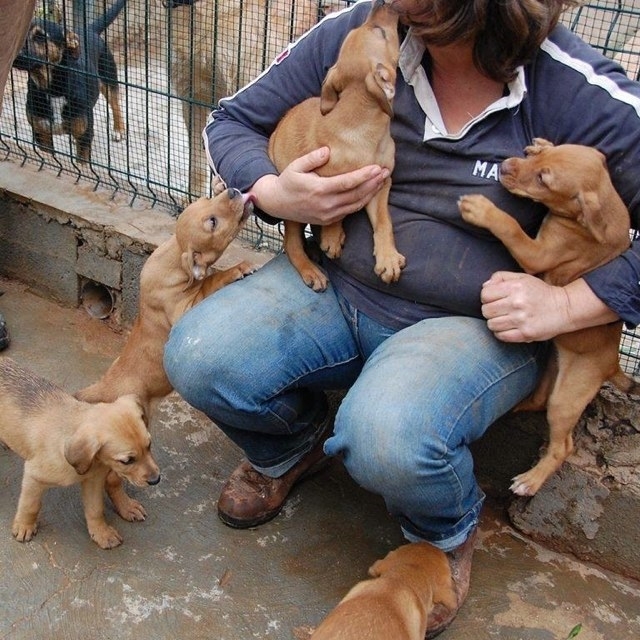 Once again we have 6 pups rescued from a ruin in Santa Catarina. Mum is small but very timid and shy. She will be caught soon and spayed. Pups are now about 7 weeks and real beauties. 5 females and one male. Five are golden brown with floppy ears and all have some Pointer genes for sure. Even though they were born in awful conditions, they are extremely social and playful. All 6 are for adoption after vaccinations and health checks. BENTA was dumped at the gate of the shelter but she was on heat so cannot go in. Instead of staying in a flightbox outside, we agreed to take her here as all the male dogs in our kitchen kennel are castrated. 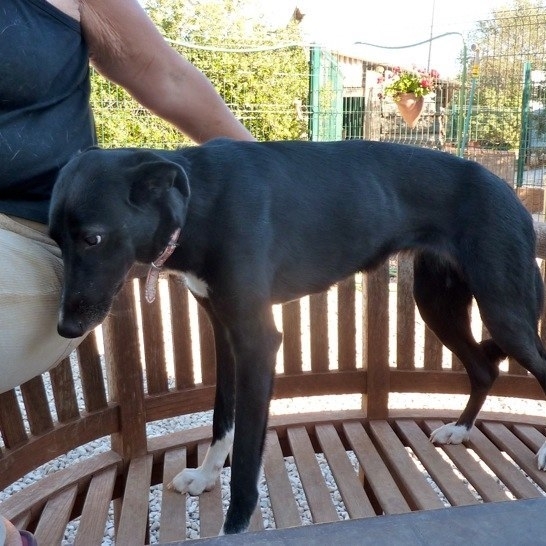 She is a lovely young dog, about 14/15 months old, very gentle and social. Likes people, dogs and cats. Sits for dinner, no food aggression. Light build, about 14kg. 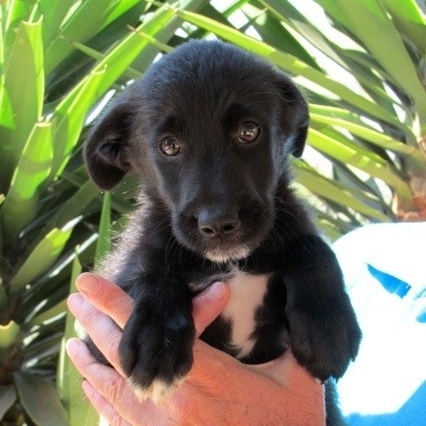 After vaccinating and spaying she will be ready for adoption. Negative for mediterranean blood parasites. Walks well on lead and enjoys it. 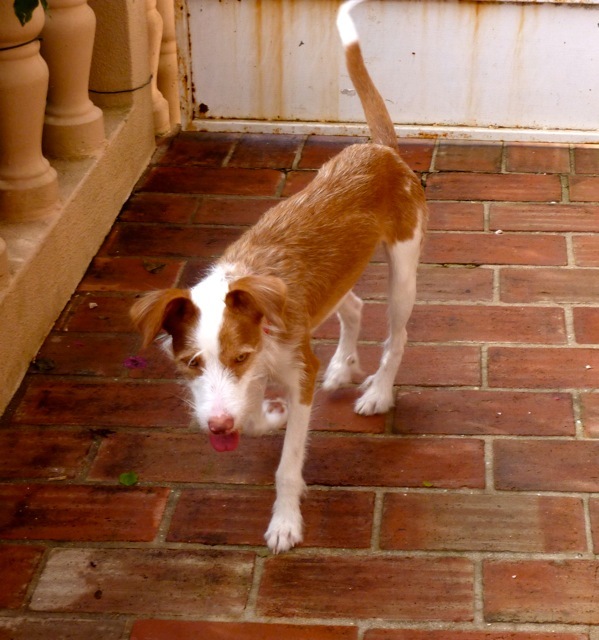 BETTY was found 15 days ago, under a car on the main road to Tavira near the Horta restaurant. She was almost killed but a lady picked her up in time. 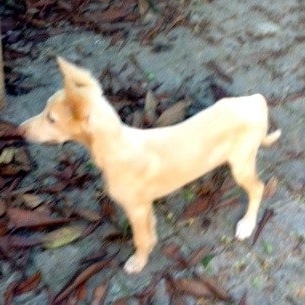 She has the tips cut off her ears and was full of scabies.We believe its gypsies that maim the baby dogs like this. She is being treated and is getting better. Otherwise she is healthy, full of energy and has had her first worming and vaccine. She is about 7/8 weeks old. 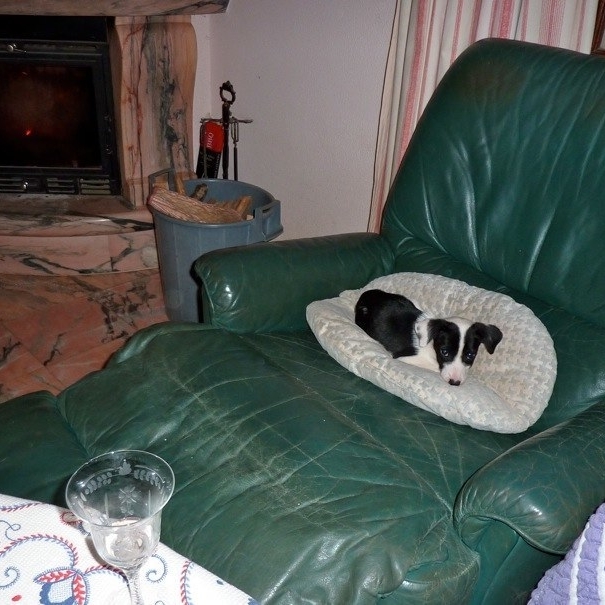 Betty will be a small dog for sure but could develop some long legs. 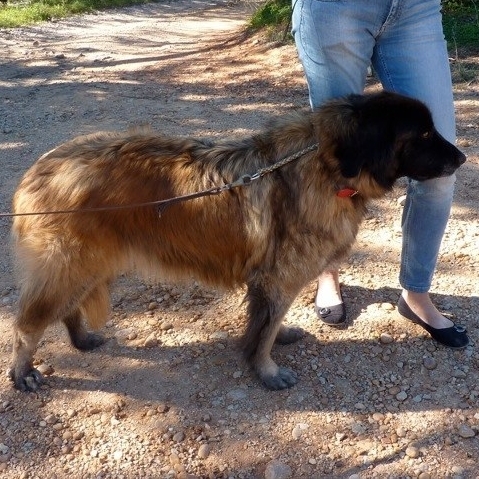 BIG BEAR lived as a stray at the Intermarche Supermarket for 6 months. People fed him but no-one wanted to take him in. One day we found him full of wounds, very depressed and just a bag of bones to look at! We took him home and have cared for him ever since. He has been thoroughly tested including for the Mediterranean blood diseases. All tests were negative but he was slightly anaemic and very undernourished. 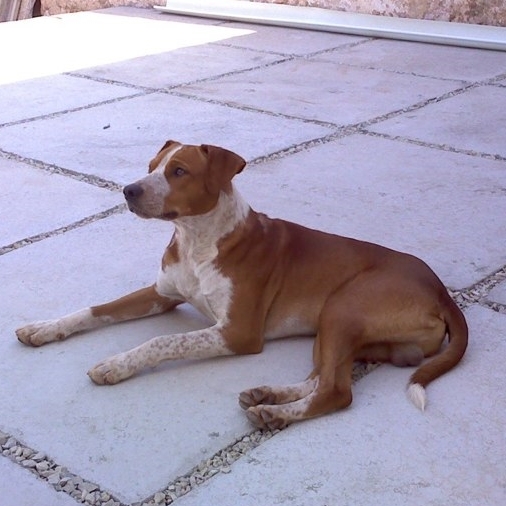 He has now been castrated and vaccinated and can be adopted. Bear is large and very gentle. Gets on with all other dogs and cats. 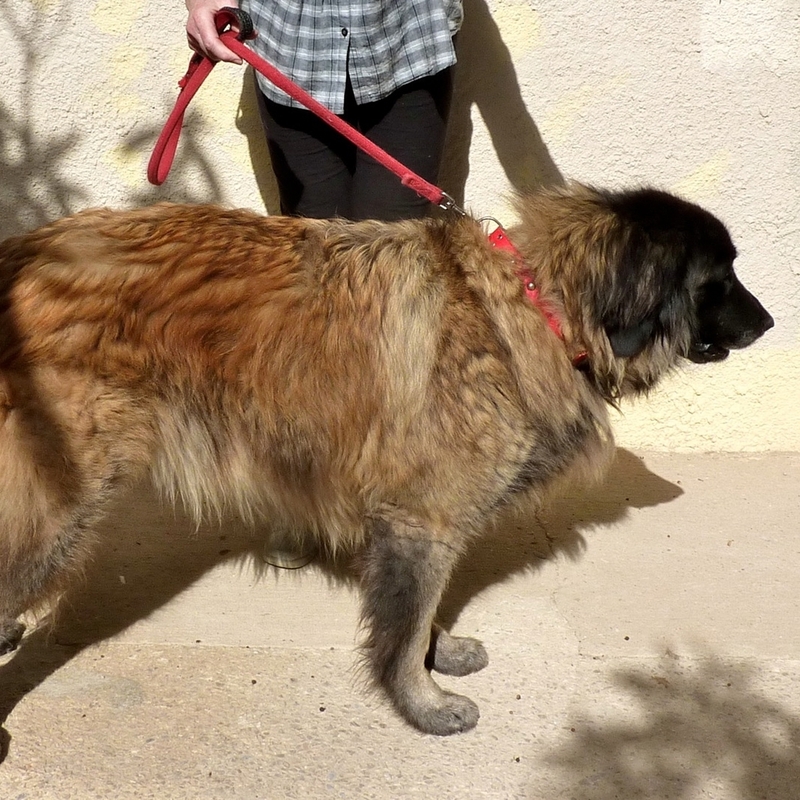 He is about 2 years' old and weighs 48kg. He is not the running, jumping, hunting dog type. He enjoys lying in his basket in his kennel and goes for a walk on the lead every evening with Adrian. His pace is a kind of trot. 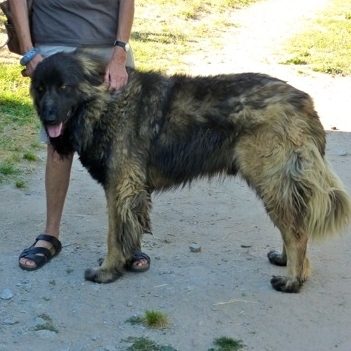 Boss, a pedigree Cão da Serra da Estrela or Portuguese Mountain dog, was dumped at a Portuguese lady by a German who moved back to Germany when he was less than one year old. However, that lady had no facilities to keep such a beautiful dog and she asked us desperately for help. So he came to us. He is absolutely a prime example of his breed, not only physically but also mentally. Good with all kind of people, animals, dogs and cats alike. 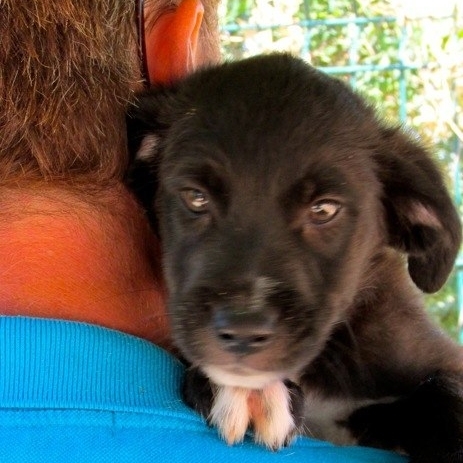 If we did not had so many dogs and other male Estrelas he would never been up for adoption. 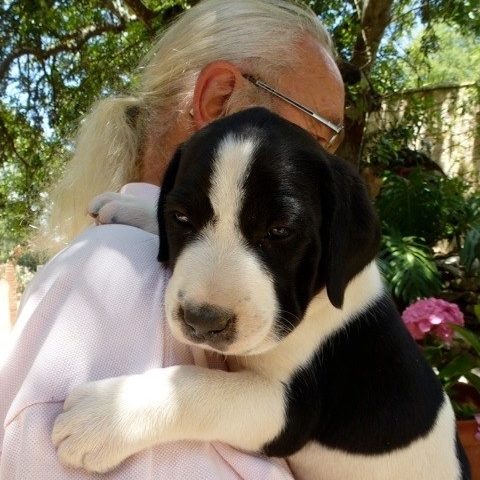 Brunetto was only 4 weeks old when he and his mother Bruna were rescued as part of the Estrela rescue operation in July 2014 (see under Stories). He was fortunate not to have experienced the hell hole situation up there in the Serra da Freita as his mother did. He developed into a normal pup and dog used to a family life. 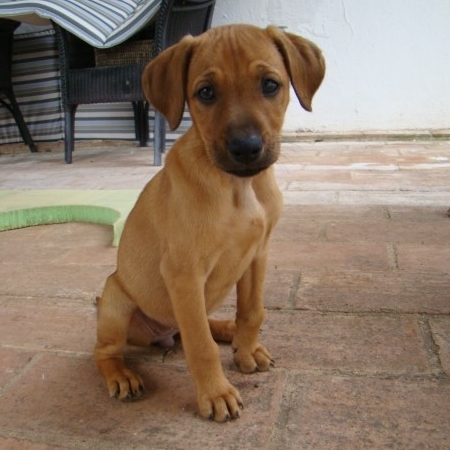 Cal gets his name from the first letter of the place we found his mum and her pups, Corotelo, part of Sao Bras de Alportel. Mum was living wild in a field adjacent to the main road to Loule. She had her pups in the hollow trunk of a Carob tree, 5 in total. At the age of 4 weeks pups start walking and exploring so we had to get them out of there, plus mother of course. There's no point in taking pups and leaving mother to wander and get pregnant again at her next season. We took them all home with us and all pups were adopted. Cato gets his name from the first letter of the place we found his mum and her pups, Corotelo, part of Sao Bras de Alportel. Mum was living wild in a field adjacent to the main road to Loule. She had her pups in the hollow trunk of a Carob tree, 5 in total. 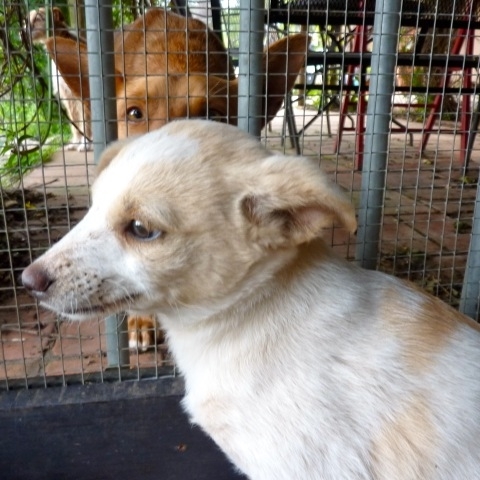 Cheryl and her brother Iyan, both still young and friendly pups, were dumped at the gate of the New Goldra Sanctuary, covered with mange. They were given the necessary medical treatment, food and lots of TLC. After a couple of weeks they were fully recovered from their ordeal and enjoyed life again. 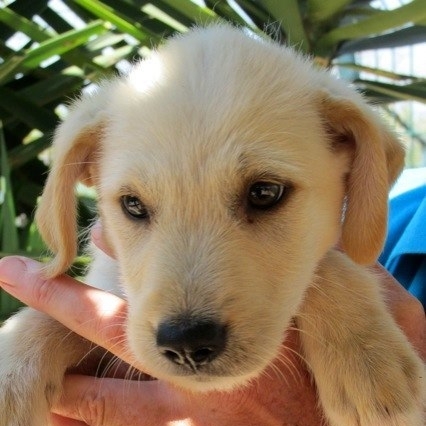 They are now loving pups, eager to please and waiting for their new families. 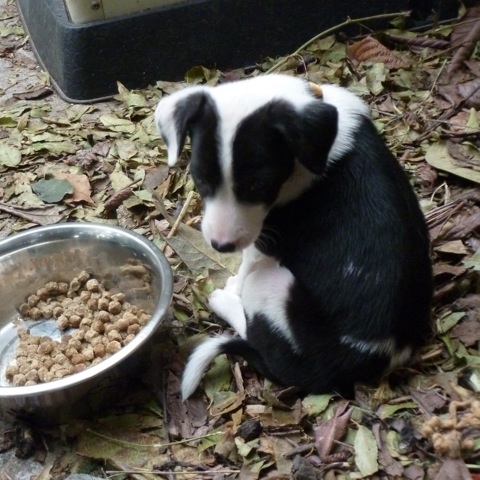 CHESS = BLACK AND WHITE AND NORIT = BLACK two cute female pups dumped somewhere as usual. Both about 6/7 weeks old, not sisters. Chess will stay small type, Norit small/medium. Very social and playful, full of fun. Wormed and had 1st vaccine. Sleep indoors in crate with no problems. love to play with other dogs both large and small. Chess weighs 2.4kg at 7.5 weeks and Norit 4.2kg at 8/9 weeks. 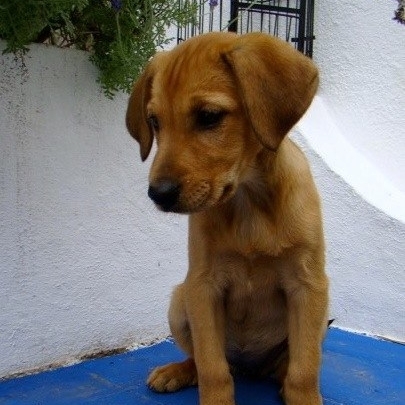 Cilla gets her name from the first letter of the place we found her mum and her pups, Corotelo, part of Sao Bras de Alportel. Mum was living wild in a field adjacent to the main road to Loule. She had her pups in the hollow trunk of a Carob tree, 5 in total. CIN is great with medium male dogs who adore her but she is not good with females in the kennel. She wants a lot of attention for herself and is jealous. Outside in her own space she is fine her ex-owner tells me. She is used to walking in town on a lead and sitting outside in cafes. Loves to jump up and be petted and stroked. Sleeps quietly all night but can bark when necessary. Needs a new home as her ex-owner is an elderly man and not in good health. 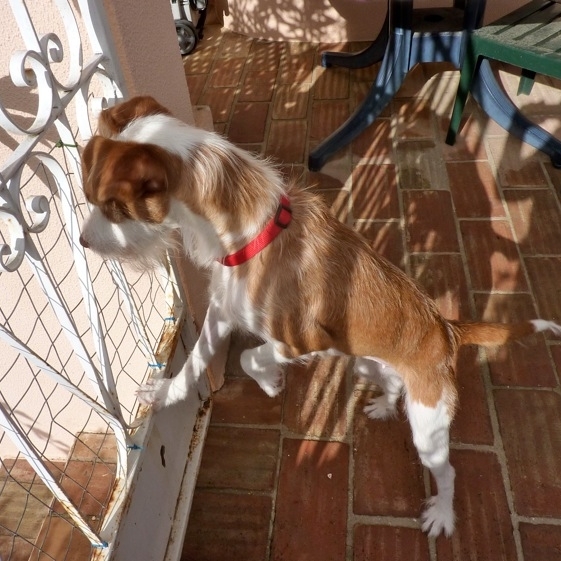 She is 3 years old, spayed, tested and vaccinated. Cindy gets her name from the first letter of the place we found her mum and her pups, Corotelo, part of Sao Bras de Alportel. Mum was living wild in a field adjacent to the main road to Loule. She had her pups in the hollow trunk of a Carob tree, 5 in total. Coise gets her name from the first letter of the place we found her mum and her pups, Corotelo, part of Sao Bras de Alportel. Mum was living wild in a field adjacent to the main road to Loule. She had her pups in the hollow trunk of a Carob tree, 5 in total. CREAMY is a wonderful, social female with unique markings in her black and white patterns. She is about 15 months old, spayed, vaccinated and tested negative for Med. blood parasites. She has been in the shelter too long and desperately needs to have a home of her own. 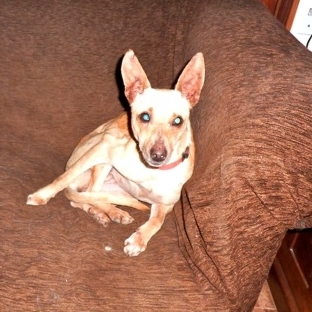 She is a small medium, weighs about 15kg, can walk on lead and integrate with all other dogs. Pups are now about 7 weeks and real beauties. 5 females and one male. Five are golden brown with floppy ears like Dominic below and all have some Pointer genes for sure. Even though they were born in awful conditions, they are extremely social and playful. All 6 are for adoption after vaccinations and health checks. 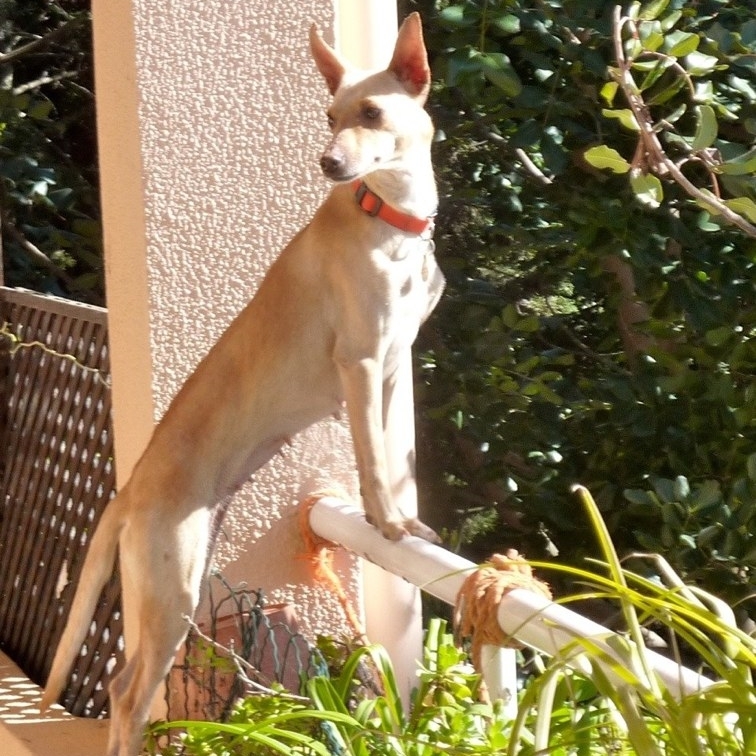 This is DOUG, found roaming the countryside in Benafim/Loule and temporarily in foster until 5 October when the lady who found him leaves Portugal. These are hard moments for rescued dogs. Where can he go now? 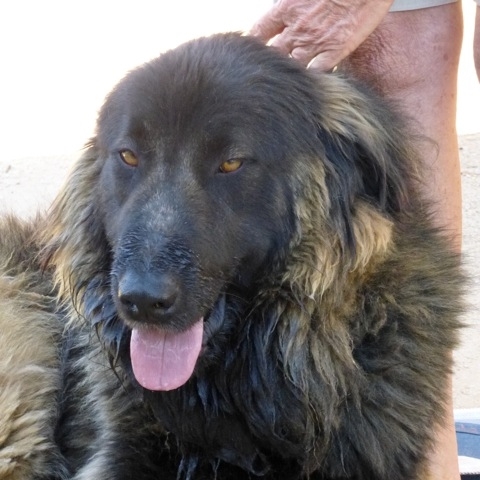 Doug is about 1.5yrs old, vaccinated, castrated and tested negative for blood parasites. He is medium size and weighs 15.5 kg. He is very friendly with people and other dogs. 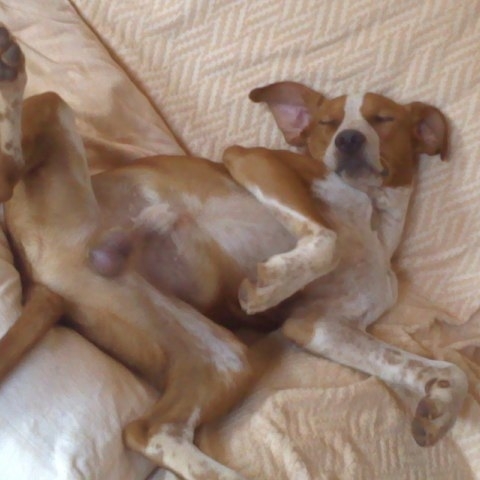 A Pointer mix. Cats we don't know. He is house trained and walks well on the lead also in town. Will make a lovely pet. 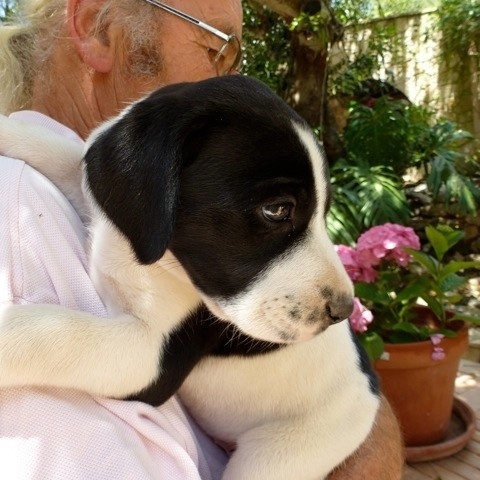 FAYE puppy of 4/5 weeks old ( 25/06/ 14) was found in an old paint bucket next to some bins in Almancil. Dutch tourists discovered her much to their horror as they were leaving Portugal next day. Nice farewell to this wonderful holiday country, sun, sea and abandoned pups by the bins. We have taken her in and she will be prepared for adoption as usual. Faye is very sweet, intelligent, social. Will make a family pet with kids and cats for sure. 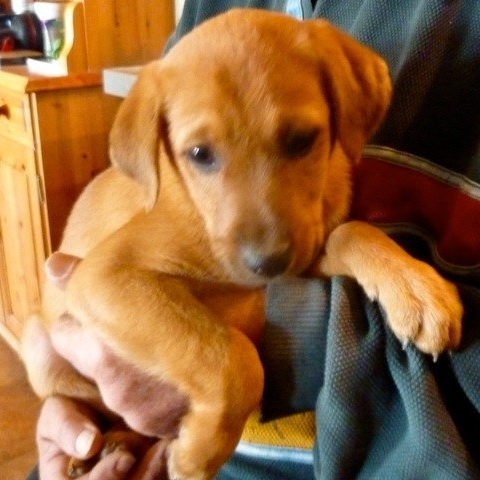 We guess she will be a medium sized, Lab type build, adult. MUM and 8 pups dumped on deserted parking lot opposite the municipal killing station kennels of Loule. 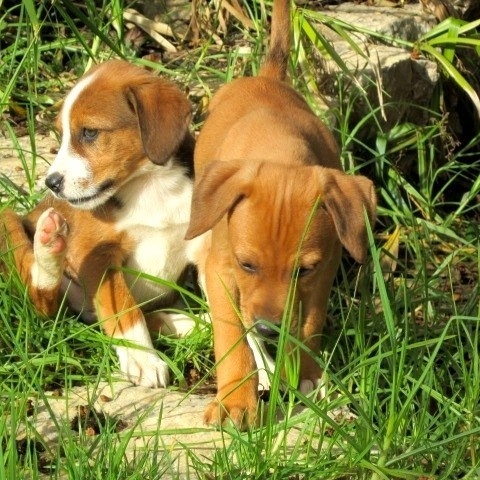 Lovely puppies, gentle, social and ALL needing homes. MUM is a small medium size and also extremely social. About 2 years old. These all had a home so why where they dumped????. HUGO was found abandoned and has not been claimed in spite of publicity in and around our area. No identification at all on the dog. Here in these photos he is in temporary foster where he had to be kept on a chain due to presence of busy main road. He has now been adopted by 2ndhand4footers and will soon be offered for permanent adoption. 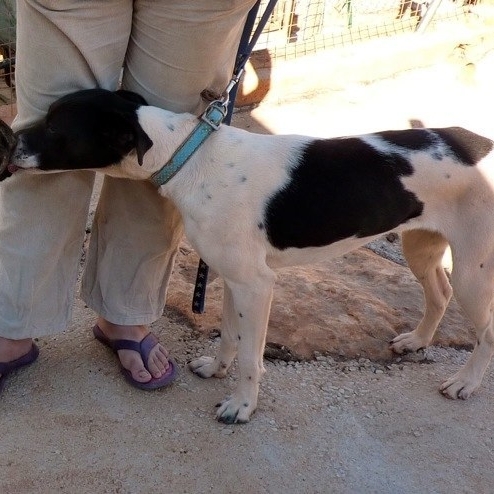 Hugo is about 15-18 months old, weighs 27kg and has been neutered, vaccinated, tested and chipped. He looks very much like a very dark liver, Flat-coated Retriever and certainly behaves like one. Wonderful dog but needs training and not suitable for senior citizens. Extremely playful and tons of energy when outside. 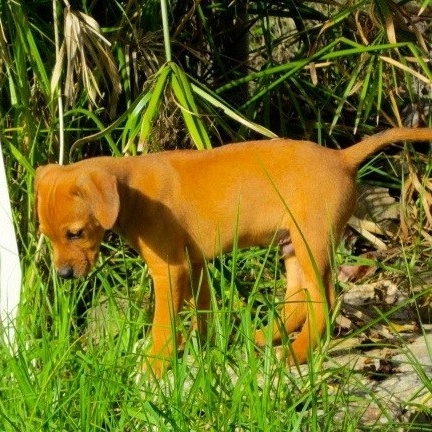 Iyan and his sister Cheryl, both still young and friendly pups, were dumped at the gate of the New Goldra Sanctuary, covered with mange. Josafina and her brother Kris, both still young and friendly pups, were searching for food together with their mother on a rough area full of chemical waste. They were seen by friends of ours who started to feed them. But as this is not an ideal place and situation we decided to go there and catch the dogs. Unfortunately mum has disappeared and was never seen again. Kris and his sister Josefina, both still young and friendly pups, were searching for food together with their mother on a rough area full of chemical waste. 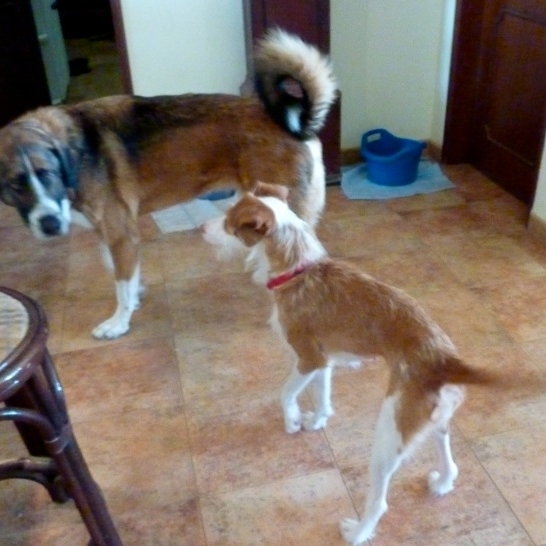 MIEPIE was found by one of our Dutch fosters roaming around a hamlet near Sao Bras. She had all kinds of male dogs attacking her and her ears and belly have wounds. After a week of gentle calling and feeding she managed to catch her for neutering in case she was already pregnant. The initial intention was to put her back in the wild but who can do that to such a sweet little girl? She weighs 7.5kg, is 38cm high and we think she is 18 months old or less. She has had pups at least once. Very short coat, golden brown. Miepie is a little shy but she is in the house with all the other dogs large and small and sleeps in a crate. She has been spayed, tested, vaccinated etc etc. Can be homed soon. 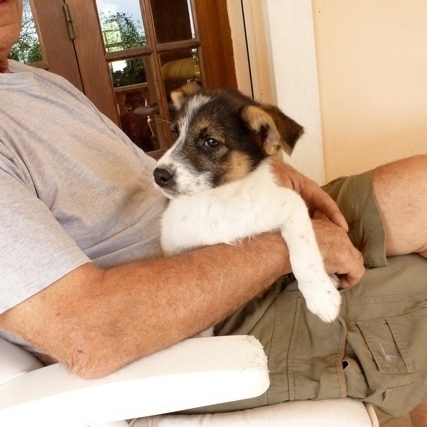 Milly is a very young Podengo knocked down by a passing car in Sao Bras. She was in great pain as the top bone in her left leg=humerus was broken in 3 parts. 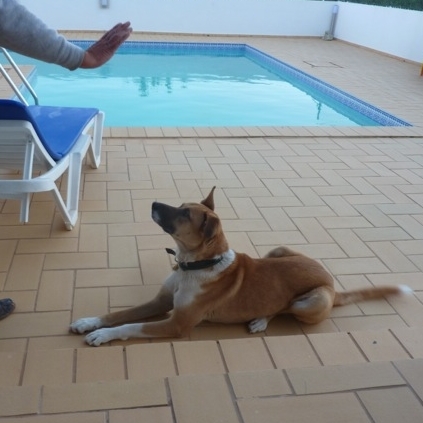 Milly was actually a stray dog being fed in her garden by a Portuguese lady. The lady contacted us because she had no means of paying for fixing Milly's leg and cannot care for a dog in this condition. Milly is now 2 weeks on from her operation and confined to a skybox most of the time. With lots of special care and TLC we hope she will make a good recovery. In 6 weeks' time the exterior support should be able to come off. In the meantime, x-rays at intervals will show the progress. These cases come at a high cost and any donations to help Milly are welcome. 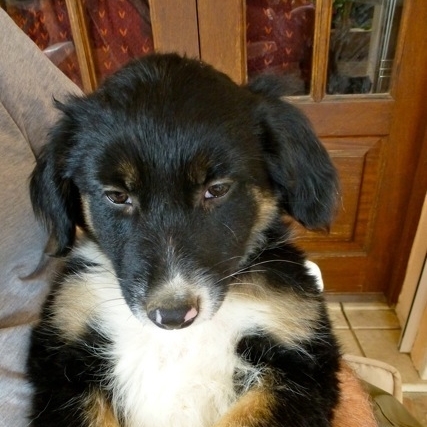 See button "donations" on how you can help us to help dogs such as Milly. 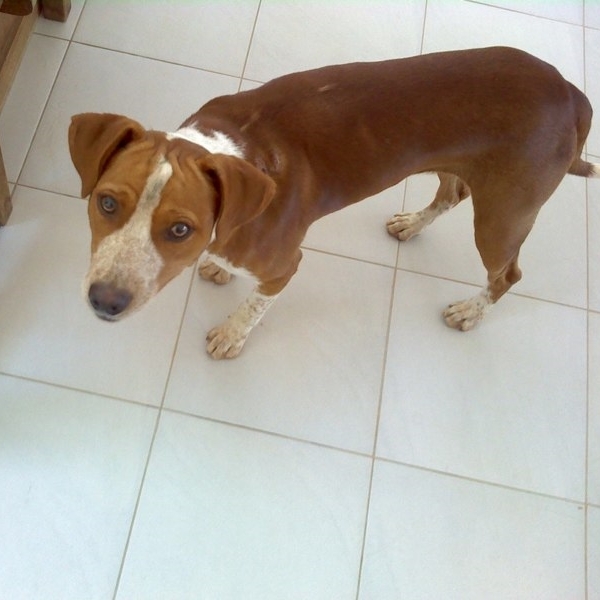 Molly is a young GS abandoned near S.Bras and found crying at a lady's gate. Molly had an old, worn-out leather collar on with an even older dog tag. This tag made us hold our breath..as it used to belong to our first ever rescue dog from 20 years ago, MOLLY, who has been dead for more than 7 years.!!!!! Dead and cremated so where did the tag come from? 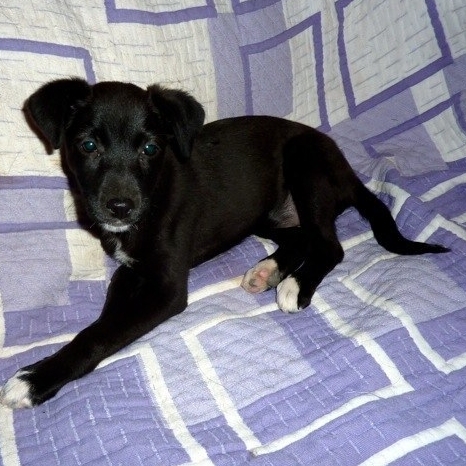 Molly will be tested and spayed soon and can then go for adoption. 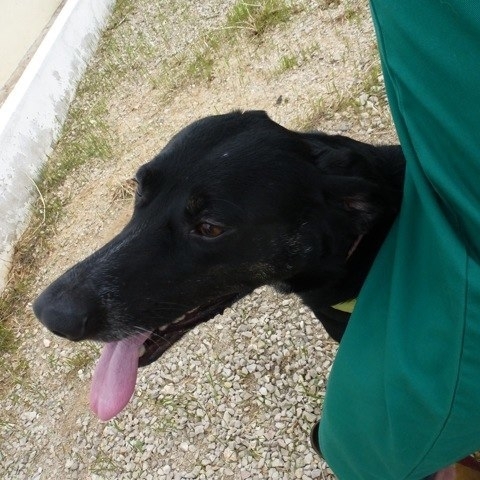 She has a lovely character, is very playful and gets on with our other dogs. 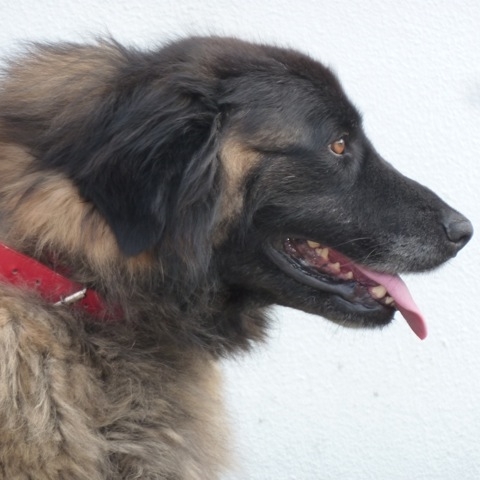 MORNA is 3.5 years old, spayed, tested and looking for a five star Estrela loving home. She is an indoor dog and not accustomed to being a watch dog at all. She is social with all other animals including cats. 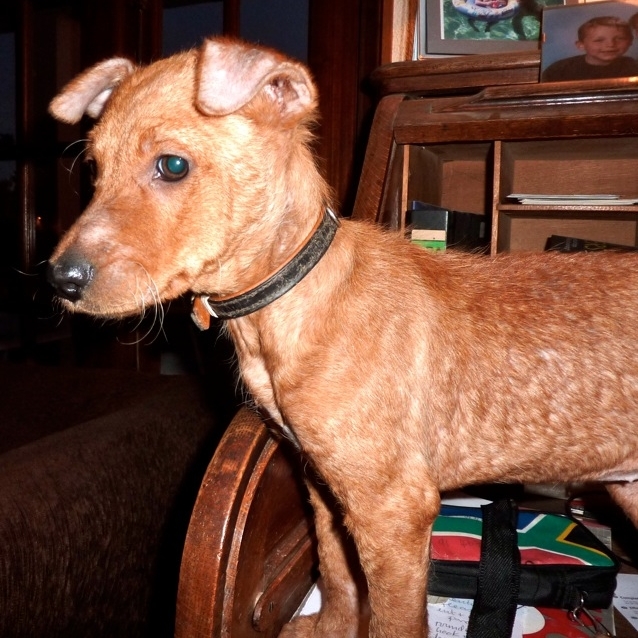 Morna has had some traumatic experiences in her short life but is gradually recovering. Still shy and lacking self confidence at this moment, we expect her to make a total recovery in the right home with the right people. 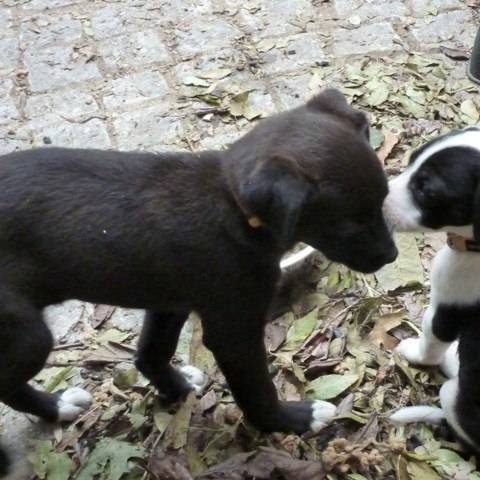 CHESS=BLACK AND WHITE AND NORIT=BLACK two cute female pups dumped somewhere as usual. Both about 6/7 weeks old, not sisters. Chess will stay small type, Norit small/medium. Very social and playful, full of fun. Wormed and had 1st vaccine. Sleep indoors in crate with no problems. love to play with other dogs both large and small. OLIVIA and her 3 brothers and sisters were born in the hole between the roots of an olive tree. They were extremely shy and as soon as somebody approached the orchard they disappeared in their hole and would not come out during the rest of the day. Mother however stayed always in the neighborhood and kept an eye on her children. In spite of the initial shyness Olivia soon became part of our dog family and changed into a normal pup in a couple of weeks. 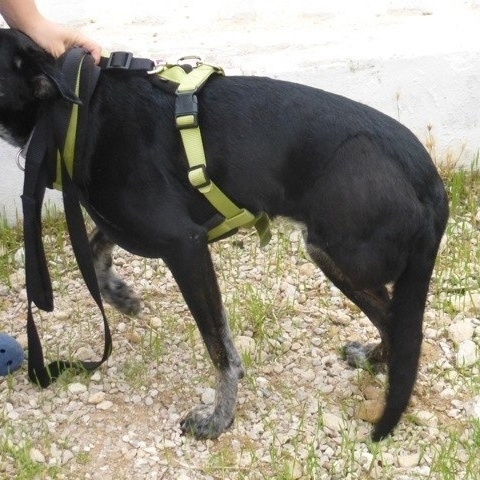 Poppy was left at the municipal kennels without any hope for a life. A long story so to keep it short we will explain she is now in foster and looking for a permanent home. She is beautiful in colour, shape and personality. 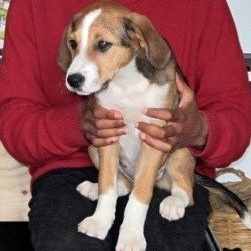 About 4 months old now and completely vaccinated etc, ready to go to her own special home. Poppy is extremely social with all other 4 footers and loves company but is also independent and does her own thing. Sleeps in crate at night and almost house trained. 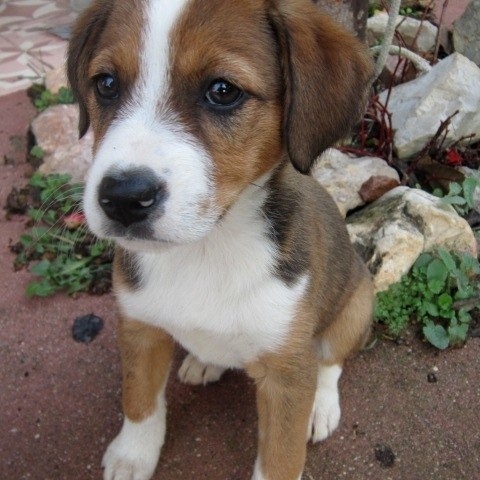 Who will take her home and give her a home for ever?? She will be a small-medium slender adult with long legs. Pups are now about 7 weeks and real beauties. 5 females and one male. Five are golden brown with floppy ears like Dominic below and all have some Pointer genes for sure. WENDY is the only tricoloured. 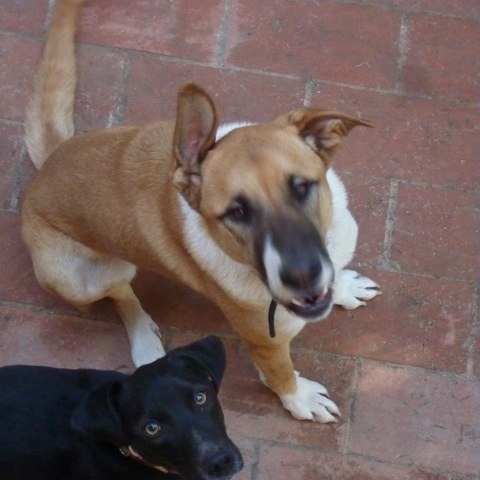 RAFA is a labrador cross about 2 years old and walks very well on 3 legs. She used to live with gypsies but was run over and left to die on the road. 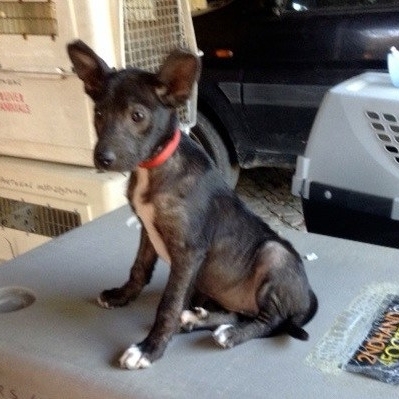 Luckily for her she was rescued and brought to the clinic in Faro where she has been living in a crate ever since. 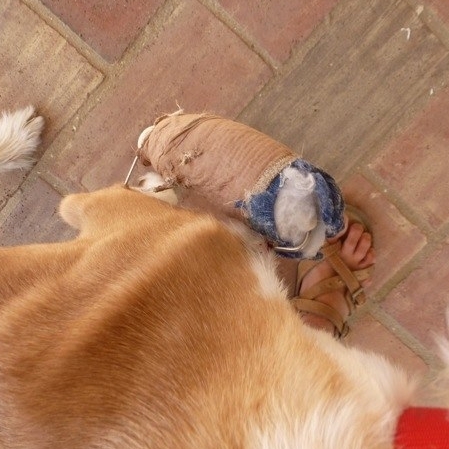 Her hind left leg had been badly injured and had to be amputated. She has tested positive for heartworm and is undergoing the usual treatment at the moment. We are looking for a very special home for this lovely girl with people who understand what it is to go for short walks and care for a handicapped dog. The dog herself doesn't know she is handicapped and it doesn't stop her from running very fast when she is loose. She loves other dogs and also cats.